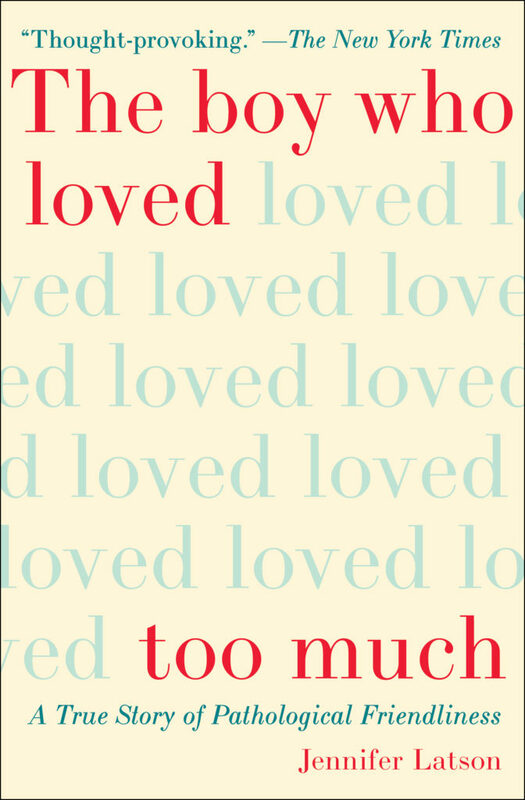 Jennifer Latson’s book, “The Boy Who Loved Too Much,” is ostensibly about Williams syndrome, a genetic condition that can overlap with autism. But it’s really the story of a parent whose overprotective instincts are one of the biggest problems her son with the syndrome faces. Williams syndrome arises from missing a segment on chromosome 7. People with the syndrome share certain traits, including an elfin visage, a love of music and a reflexive friendliness with familiars and strangers alike. The syndrome, which affects about 1 in every 10,000 to 20,000 people in the United States, can also involve intellectual disability. Latson, a journalist, follows a boy with Williams syndrome whom she calls Eli and his mother, Gayle. Eli, a much-loved boy, has a fascination with floor polishers and vacuum cleaners and idolizes the children’s television character Cookie Monster. Against the backdrop of disability, Eli’s character arc is typical of a boy navigating puberty — including the sudden onset of romantic feelings toward others and working out how to manage the physical manifestations of male arousal. Gayle’s journey is less conventional than her son’s. Like many parents, she starts out wanting to cocoon her son from all of life’s insults. But unlike some parents, she accepts that her protective instincts pose a risk to Eli’s independence. The story tracks Eli’s earliest childhood, starting with the developmental delays that sent his mother searching for answers. In addition to its positive attributes, Williams syndrome carries health risks, including cardiac problems and adult obesity. But Gayle’s greatest concern is defeating the dire predictions that clinicians made about her son’s social and academic prospects. Through much of the story, Gayle anticipates only failures — that Eli won’t have friends, won’t progress in his development and won’t ever live independently. She’s a single parent, and she is unable to manage her anxieties enough to allow her son a little freedom. She gets a hint of how that freedom might look when she and Eli attend a camp for children with Williams syndrome and their families. She’s baffled by the way the other parents let their children run around unattended. When a girl at the camp blows off Eli’s clear romantic interest, Gayle gets involved in a way she later regrets; she learns that her own pain from the experience is greater than anything her son registers. Back at school, when the team managing Eli’s education plan wants to focus on academics as much as on life skills, Gayle balks. She thinks Eli can’t do the work, that academic goals are largely pointless compared with his inability to tie his shoes. Her faith in her son’s potential is limited. The first half of the book reads the way Eli’s life perhaps felt during these years — constrained and carefully shaped to fit somebody else’s goals. Originally part of Latson’s thesis for a graduate program, the careful prose in this half is dutifully sprinkled with information about gene therapy, how the syndrome and its cause were identified, and examples that show what people with the syndrome are like. But then, in the second half, the book becomes a roller-coaster ride that makes it worth the read. The latter half of the book slows down only with a boggy chapter on empathy, which joins several other references throughout the book in juxtaposing Williams syndrome and autism. Although the two conditions are often viewed as complementary opposites, Latson notes, people can be diagnosed with both. “The Boy Who Loved Too Much” focuses almost exclusively on Eli and his mother. Given this narrow lens, it’s a relief when other characters have walk-on parts, such as the insouciant parents at camp and the haughty love interest who rejects Eli. That said, the final chapters and the epilogue rivet the reader with the tension of whether Gayle will finally realize how badly Eli needs a little less shielding and a little more risk in his life. Emily Willingham is a contributing writer for Spectrum and a journalist covering health and neuroscience. Her work has appeared in Scientific American, Forbes and The Washington Post, among other publications.